Project Management Calculator is a unique product for people engaged in Project Management. 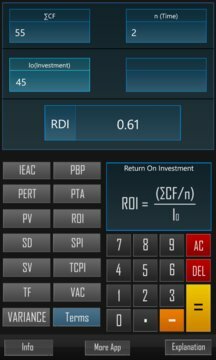 This calculator is best and a valuable resource for students who wish to learn about Project Management formulae and a good reference for professionals who are in the field of Project Management. This calculator is composed of 31 formulae with explanations. 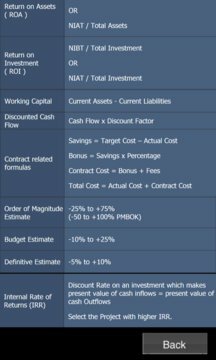 So if you need to calculate Earned value or want to know about the Variances, whether it is time related or cost, this calculator has it all. Mini display for actual formula and multiple formulas scroll option to choose from.